With a long way to go to meet the government target of one million fewer claimants on Incapacity Benefit by 2015, there is an increasing recognition that efforts must focus not only on returning people from welfare to work, but also on preventing the slide from employment towards benefits in the first place. Intertwined with this challenge is the prevalence of mental ill health in the UK population and workforce, with as many as one in six employees suffering from some form of common mental illness – such as stress, anxiety or depression – at any one time. 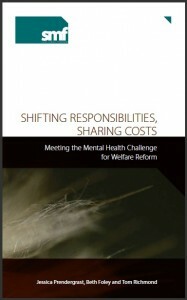 Mental ill health presents significant costs for individuals, employers and the state, but although all these stakeholders would benefit from the provision of effective and timely interventions to support those with common mental health conditions, diluted responsibilities mean there is a market failure in the provision of appropriate products and services. This study explored the significance of mental ill health for UK businesses and society, the benefits of remaining in employment for those with mental health conditions and the barriers to doing so. It argued that employers should be encouraged to take on responsibility for the provision of appropriate support and advocated a range of mechanisms which the government should explore to offer effective incentives.